Júlio César Bueno has been a partner at Pinheiro Neto Advogados since 2001. He is based in São Paulo and has considerable national and international experience focusing on the practice of construction law and engineering contracts (including the use of FIDIC standard forms), project finance, public procurement, as well on arbitration and mediation proceedings, and dispute boards. He represents some of the world’s largest organisations (owners, multilateral agencies, financial institutions, contractors and developers) in their global infrastructure and construction projects located throughout Brazil and the rest of Latin America, and in Africa. He assists clients across the entire project spectrum and recent examples include gas facilities, power plants (nuclear, coal-fired, gas-fired, combined cycle and hydro), wind farms, steel manufacturing facilities, copper mining facilities, coal mining facilities and ports. He is the president of the Brazilian Society of Construction Law. He is also president-elect of Region 2 of the Dispute Resolution Board Foundation, and a former officer of the International Bar Association’s Latin American Forum and the International Construction Projects Committee. He is also a fellow of the Chartered Institute of Arbitrators and the Royal Institution of Chartered Surveyors. He is a fellow of the International Academy of Construction Lawyers, the coordinator of the Dispute Board Commission of the Center for Arbitration and Mediation (CAM/CCBC), a co-coordinator of the Brazilian Arbitration Committee’s working group dealing with arbitration in infrastructure contracts, a board member of the International Construction Law Association and a member of the Mediation and Arbitration Chamber of the Institute of Engineering of São Paulo and the Brazilian Institute of Civil Procedure Law. 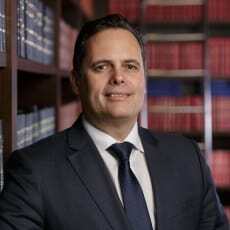 He holds a law degree from the University of São Paulo Law School (LLB, 1991), a master’s degree from the University of Cambridge (LLM, 1995) and a doctorate from the University of São Paulo Law School (PhD, 2001). He has published several articles on matters relating to civil procedure law, energy, engineering contracts, infrastructure and construction law. He is recommended by Who’s Who Legal (for construction, project finance, government contracts and public procurement); Chambers Latin America (for construction and projects, and dispute resolution); IFLR1000 (for project finance); Practical Law Company (for construction and projects); and Brazilian directory Análise Advocacia 500 (for construction and projects, dispute resolution and contracts).